What Are the 4 Main Types of Landforms? Topographic maps show the contours, or shape, of the land. Every map has a legend that explains the different colors and patterns. Normally contour lines will be brown and waterways will be blue. Whether you're hiking, firefighting, hunting or exploring, topographic maps provide you with information necessary for planning and carrying out a safer visit to the outdoors. To calculate contour intervals, find the elevation difference between two adjacent index lines or index contours. Divide that elevation difference by the number of contour intervals between index lines (usually five). The result equals the contour interval. Contour lines show the shape of the land. A single contour line marks a line of equal elevation, meaning that if the contour line measures an elevation of 1,000 feet above mean sea level, then every point along that line is 1,000 feet above mean sea level. 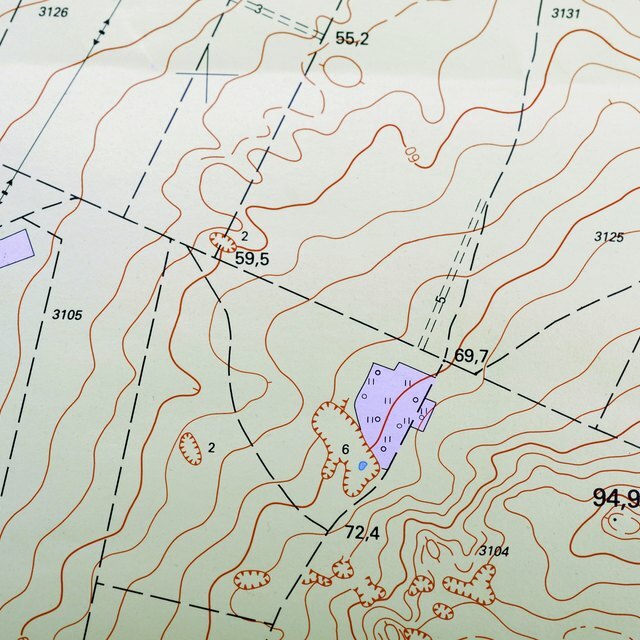 Contour lines never cross since a point on the map cannot have two different elevations at the same time. The farther apart the contour lines appear on the map, the gentler the land's slope. The closer together the contour lines appear, the steeper the terrain. Where contour lines come very close together, a near-cliff occurs. If the landform is a vertical cliff, the contour lines come almost together and may look as if they are merging. Overhanging cliffs may have one line crossing over another (this is the only time these lines can cross), with one line appearing as dotted. Be aware, however, that smaller cliffs can occur between contour lines, even in areas of overall gentle slopes. A 15-foot-high cliff, for example along a stream channel or due to minor faulting, would not necessarily show if that cliff lies between two contour lines, especially if they have a greater contour interval. A map's legend usually identifies the contour interval on the map, but sometimes only part of a map is available. Knowing how to calculate the contour interval becomes a useful skill. On most maps, every fifth contour line, shown as a heavier or darker line, is an index line or index contour. These index lines will be marked with their elevation. Find the elevations of two adjacent index lines. The higher number shows the uphill elevation. Find the difference between the two elevations. For example, if the uphill elevation equals 1,000 feet above mean sea level and the lower elevation equals 800 feet above mean sea level, the difference in elevation equals 200 feet. To calculate the contour interval, start by counting the contour lines from one index line to the next index line. Maps usually count five contour lines from one index line to the next, including that next index line. As when counting from one number to the next, like from five to 10, start with the next line up from the index line, counting each contour line up to and including the next index line. To find the elevation interval between contour lines, divide the elevation difference between index lines by the number of contour lines from one index line to the next. In the example above, the distance, 200, is divided by the number of lines, 5. The contour interval equals 200 ÷ 5 = 40, or 40-foot contour intervals. If, on the other hand, the elevation difference between index lines had been 100 feet, the contour interval would be 100 ÷ 5 = 20, or a 20-foot contour interval. GPS units do not work in all areas, especially mountainous regions. Topographic maps remain the best option for wilderness trips, whether on foot or in a vehicle. Any wilderness trip planning should include leaving a planned route and return date with a reliable person or agency. G, Karen. "How to Calculate Contour Intervals." Sciencing, https://sciencing.com/calculate-contour-intervals-5344928.html. 18 May 2018. What Is the Importance of Topographic Maps?